After creating the electric powered MEV Missle, a cross in styling between the Rocket and Sonic 7, Stuart Mills sold the project to South Nottingham College to help teach students about vehicle maintenance, electrical skills and alternative energy vehicles. The Newark Advertiser ran a nice piece on the students who have worked on the project. 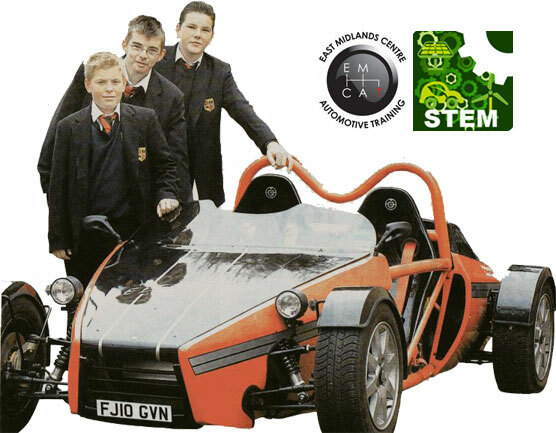 Magnus School pupils Ryan Pegg, Josh Garton, and Mark Loveridge, all 15 years old, have been working on an electric car as part of a project with South Nottingham College. Pupils at the Magnus Church of England School are the first in Newark to have completed a project that demonstrates the role science and engineering can play in changing the way people live. For four months six pupils have worked on a unique electric car as part of the Science, Technology, English and Maths (STEM) project run by the South Nottingham College. They have all achieved their level one award in vehicle maintenance by completing modules in low carbon technologies, vehicle electrical foundation skills and environmental awareness. The car, called the Missle, was purpose-built by Mansfield-based company MEV. It is powered by an electric motor and rechargeable batteries and can reach speeds of up to 60mph. It is the only one of it’s type in the world.